1st Choice has been operating successfully for over the past 20 years and we have during that time, aimed to exceed our customers expectations at all times. We are a nationwide same day Courier Service. We provide 24 Hour phone and courier service. This service is in constant use and is part of our day-to-day operation. In addition to our business accounts, we are one of the few courier companies that is trusted by both the NHS and PRIVATE HOSPITALS to deliver blood and surgical equipment nationwide, to very tight deadlines. We would appreciate the opportunity to discuss further your requirements and the opportunity to become a partner in the delivery of a high quality and efficient service to you and your customers. Phone anytime for us to support your needs. Excellent service and very reasonably priced! ! Highly recommended! Thank you for the prompt collection and safe delivery of our parcel. Excellent service, We used Johns company twice in a week, Both times I needed an immediate pick up and drop off service, Both times it worked out great. 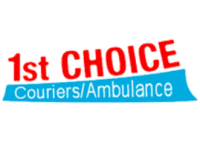 1st Choice are our only choice of courier. We've worked with John and his team for years and the service we receive is second to none. 1st Choice provide us with a brilliant, speedy and professional service. I wouldn't look for another company to represent us when delivering to our clients. I called 1st choice with an urgent collection and delivery request. Another company had told me it would be a 90 minute wait, but the very friendly and helpful John, told me he could get a driver to the location within 10-15 minutes - a huge relief for me. The delivery arrived just in time for what was needed! So I'm very grateful for the helpful, speedy and professional response - and the very reasonable price. I will definitely use them again if I need a courier service in Leeds.